Leda Mechanical Colored Pencil set with two cases of colored lead and sharpener for drawing and sketching. Leda Mechanical Colored Pencil Set a Thing of Beauty. Like to sketch when traveling but don't have space for all of your gear? Leave your colored pencils at home. Take Leda's clutch lead holder with one of two refill packs of colored leads for easy packing. The six sided mechanical pencil is perfect for conserving space and simplifying your life as an artist. Ten colors to choose. Each case has Red, Yellow, Blue, Green, Purple, Brown, Orange, Grey and White colored leads. The pencil comes with one black lead for a total of 21 leads to work with. Reduce space 20 times when you take Leda as your travel companion. High grade #10 colored leads offer a rainbow of artistic options. Good for coloring books, doodling, comic drawings, or adding some color to your serious art and sketches. Perfect when drawing in your Leda sketchbooks. Leda's Mechanical Pencil Set makes a great gift idea for the creative people in your life. 5 percent net profit donated to Art with Heart, a community program that uses art therapy to help kids and teens deal with hardships in their lives. NO RISK: if you find that this pencil and leads are not perfect for your style of making art, simply request a refund. Leda Art Supply of Kirkland, WA is dedicated to helping artists make the world a more beautiful place. Add the Leda Mechanical Colored Pencil Set to your cart above and start your next masterpiece today! 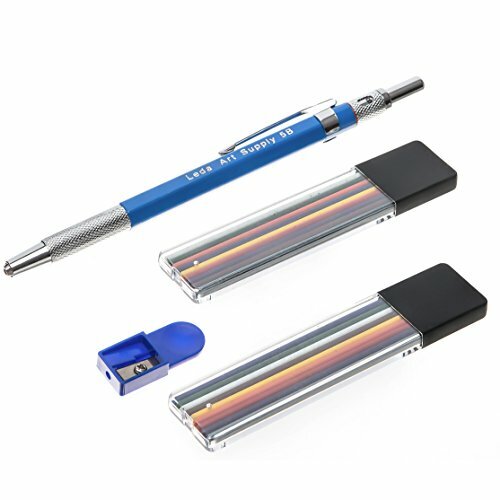 EASY GRIP LEAD HOLDER: Six-sided polymer pencil tipped with brass finishing. Fits any size of lead. Comes filled with a black lead. TWO MIXED COLOR LEAD REFILL CASES: Each refill case comes with 9 pieces of high grade colored leads. Leads are 3.5 inches long. A double rainbow of artistic options. You get Red, Yellow, Blue, Green, Purple, Brown, Orange, Grey, and White colored leads! BONUS SHARPENER: Use lead sharpener to make lines as thin as you choose. GENEROUS SUPPLY: Like getting 18 colored wood pencils. Mechanical holder comes with one black lead for a total of 19 leads. Enough to color your world for months! TRAVEL FRIENDLY: compact and easy to pack around. Drop it in your purse or backpack in case you get a spark of inspiration while on the go. Sketch in living color on your next world tour! Add the Leda Mechanical Colored Pencil set to your cart above. If you have any questions about this product by Leda Art Supply, contact us by completing and submitting the form below. If you are looking for a specif part number, please include it with your message.